Home » Other Crafts & Crafty People » …And the Trade Goes On! …And the Trade Goes On! Lynn’s came today. Your beads made it to the Paper Bead Soup Lynn! 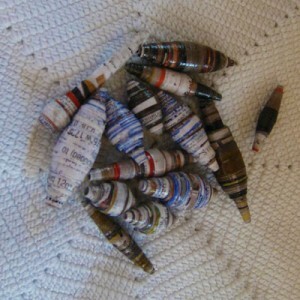 Kayla’s other hobby is scrap booking, and her paper beads were made from left over paper. The rest of the kits will be shipped on Tuesday. I would love to see what you are going to be making with your kit; be it bracelet, necklace, earrings, a brooch? I am hoping that everybody would participate in our “Show and Tell” portion of the trade. So here’s what I’m going to do: the first 10 that submits an image (email it to me), will get a unique strand of paper beads made by the Philippine Women. I want to thank everybody that participated in the trade, I hope you had fun as much as we did. Anyone, who would like to host the next Paper Bead Trade? Let me know and we will announce it here, too. 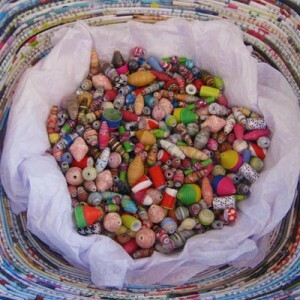 Janice, Just wanted to let you know that I blogged about the paper bead trade here. Thanks again! Awesome, Janice! Thanks so much for organizing this! You’ve connected us all in a special way! @Deb thanks for the kind words! If we are interested in hosting the next paper bead trade, then what would be the duties and responsibilities of the host? Lynn’s and Kayla’s beads turned out great! What a beautiful picture of the “paper beads soup”. So colorful! I also wanted to say Thank-You also to Kayla for helping you out on the paper bead trade! You’re welcome, Deb, it was so much fun for me as well 🙂 Kayla. 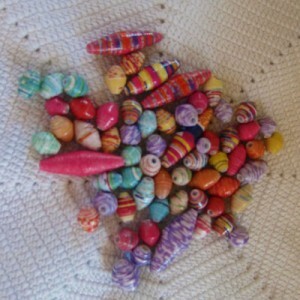 yumm paper bead soup haha gosh every ones beads look great! The colors stand out so much! I can’t wait!